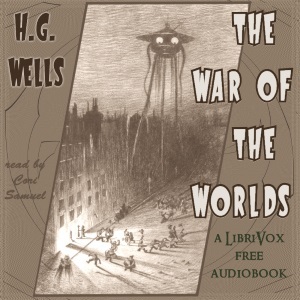 New audiobook: The War of the Worlds « To Posterity -- And Beyond! The works of H. G. Wells joined the public domain in Europe on 1st Jan this year. It seemed plain rude to let that milestone pass without my taking on something of his. The existing recordings of War of the Worlds at LibriVox were both over 10 years old, so I decided that was a good one to pick. Ably abetted by David and Dave, on coordination and proof-listening duties respectively, this was a relatively quick project to produce, starting on 24th August and launching on 8th October (so, 46 days all told.) It runs slightly under 7 hours. You can listen to the first section below. Or visit the LibriVox catalogue or archive.org to download, for free, The War of the Worlds in various file formats. Should you wish, there’s a very playable drinking game around his use of the word ‘tumult’! He must’ve won a Scrabble tournament with it or something, because he loves it unreasonably. I started listening to your reading of The War of the Worlds the moment I found it. I’m picky about female readers on Librivox, but I rather like listening to you read. I was excited to see you had read H.G. Wells- who is one of my favorite writers. Your voice is so deliciously soothing, I could listen to you read nearly anything. Tonight I’m listening to your reading of The Secret Agent- Conrad is another favorite of mine. Thanks for your efforts, and sharing these excellent books. Great reading, high quality audio, clear and with great pacing. One of my favourite audio books.